Holds 1 oz of paint. Approx. 2-3/4" diameter. Holds 1 oz. of paint. Pack of 100. I organize crafts for VBS and this was the first time I have used these little trays. 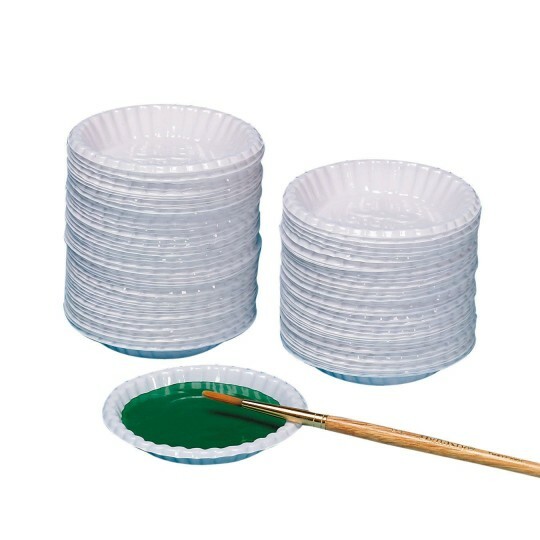 We used them for paint sorting beads and glue. I will be buying them again! I use the trays to hold glue. I give each child a tray and Q tips. Children use less glue and not as messy as bottle glue. Wash trays with soapy water or trash them. I use these plastic paint tray at camp for lots of campers everybody can have their own paint and if I have time I can wash them up or throw them away if there is no time for clean up. They are inexpensive and handy to use. Our residents use these for more than just paint. They hold a variety of small items. used for face painting booth at gathering of over 750 -- worked well dividing the face paints among the painters....definitely kept it cleaner and neater - easy to clean up at the end of the day.